This is a great recipe full of flavor for those who are on a low sodium diet. Healthy never tasted so good! Best of all this is one of the most simple recipes to cook. 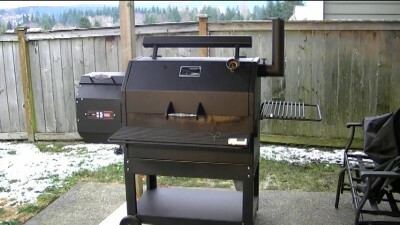 I'm also premiering my new Yoder YS640 Smoker. 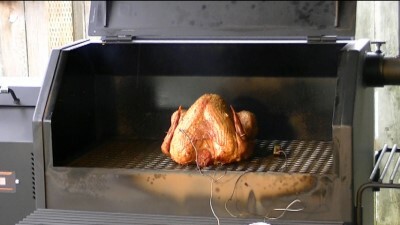 This is the first HD video smoke shot using the Yoder YS640 smoker. Keep your eyes on this cooker as it's going to be drawing allot of attention. This is one well built and tuned smoker. Built by guys who love to cook and built to last. Yoder has been building competition grade smoker for years. 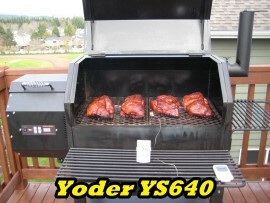 Right out of the gate the YS640 has been winning BBQ competitions. My hats off to the pit masters as well. It's comes down to the team and pit becoming one! Let's prep the turkey. I started with 1 12 lbs. young Turkey. Rinse the turkey in cold water removing the neck and parts from both the chest and neck cavities. Place on a cookie sheet and pat dry with paper towels. Now put on some food handling cloves. Now we will inject the bird. Use a sanitized injector needle. I wipe mine down with alcohol then rinse it in very hot water before using. Using the flavor injector, inject the bird about every 2 inches with the Chicken Stock. In this recipe I used a low sodium Chicken Stock. When Injecting press firmly on the plunger and slowly draw the injection needle out of the meat. this will evenly distribute the liquid. Now we will season the bird. Rub Olive Oil or in my case (I ran out) vegetable oil all over the exterior of the turkey. This will help the skin reach a nice crispy brown. Lightly shake on some Garlic Powder followed by a fair amount of Mrs. Dash Garlic & Herb seasoning. Follow this up with a nice thin coating of black pepper. Chop 2 to 3 cloves fresh garlic and rub the garlic on the bird. Next give it another light coat of Mrs. Dash. Refrigerate for an hour or so. This is a great time to fire up your smoker and bring it up to temperature. I like to bring my Yoder YS640 up to 230 degrees. Then I drop the temp to 180 to 190 degrees. I like to smoke lower for the first hour for larger birds and 1.5 hours for smaller birds. I have found get more smoke from the cooler fire and better flavor. Let's get to smoking! . In this case I used BBQr Delight Sugar Maple pellets. Once the smoker is up to temperature put the bird on the grate and get to smoking! Don't forget to spray your grates down good with PAM. 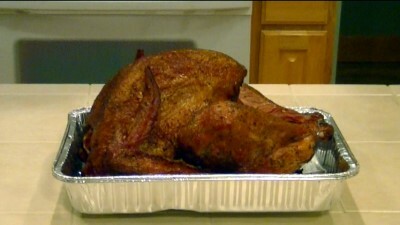 Smoke the Turkey for one hour @ 180 - 190 degrees. Then Increase the temperature to 230 degrees. Smoke for another 3.5 hours. Cooking time @ 225 is 30 minutes per pound so you with have to do some estimating based on the size of the Turkey and the average temp. Once the Turkey reaches 155 degrees increase the cookers temperature to 300 degrees for approximately 1 hour. 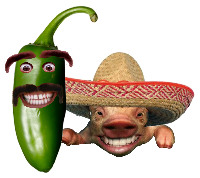 This will provide for a nice crsip skin. Remove the birds when the internal temperature reaches 168 -170 degrees. This usually takes about 6 hours of cook time for a 12 lbs. bird @ 225 degrees. That's it! This is a very easy recipe to follow and will produce tasty results.